As a frustrated geologist of years too many to mention, I have an almost unquenchable thirst for knowledge on the subject, particularly since my family’s trip to Grand Canyon last year. But for the keen beginner or ‘interested layman’ it can be a struggle to find books on the subject that adequately help. Yes, there are plenty of geology books, but all too often the infamous ‘geo-jargon’ is there to stop the wanabee geologist in his tracks. As I’ve mentioned before, I needed a book on Grand Canyon that went some way to answering the myriad of questions I needed answering when I returned home to ‘Blighty’. Wayne Ranney’s book, ‘Carving Grand Canyon’ answered my prayers by laying out all the theories and mysteries surrounding the canyon and it’s history in a highly enjoyable and understandable way. It’s a book that will work for anyone with a modicum of interest in the subject. Such was the impact of this book on me personally, it caused me to look beyond Grand Canyon and outwards to the Colorado Plateau as a whole. The more you look around Arizona, Utah, Colorado and New Mexico and the staggering geological wonders to be found there, the more fascinating the American south-west becomes. 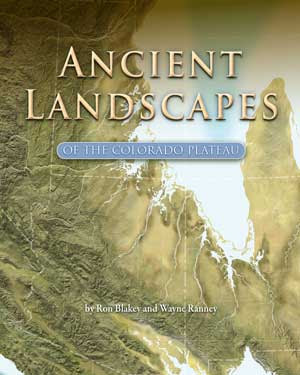 So, right on cue, Wayne in collaboration with his old college lecturer, Ron Blakey, last year published a truly stunning book entitled ‘Ancient Landscapes of the Colorado Plateau’. 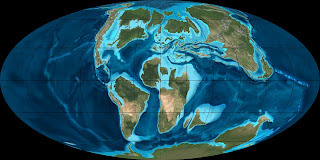 Viewers of this blog will hopefully have noticed the little slideshow (in the right hand column) of Ron’s palaeogeograhical maps of the world. These have been available on his own web site for some time, but this book at last brings his ground breaking maps to a wider audience. Palaeogeographical maps are strangely absent from many geology books these days and I find this odd. For me and I’m sure many others, it is difficult to visualise when looking at a geological formation, just what the region looked like at the time of deposition. Throw plate tectonics into the mix and the job becomes even harder. ‘Ancient Landscapes’ is an absolute triumph in this respect. The book is split into the essential periods starting with the early Proterozoic (1,750 million years ago) through to the Cenozoic (65 million years ago) and to the present, with each chapter readable on its own. Each period includes varying numbers of truly stunning maps that along with Wayne’s typically understandable text really bring it all to life. As Ron himself explains, the maps have to involve a degree of ‘artistic licence’. Obviously, no one can know for sure what the area really looked like at these points in time, but the maps are based on thorough and accepted research that Ron Blakey has seemingly spent his life drawing together. It is fascinating to read that he created the stunning images from numerous satellite images of modern comparable landforms that he ‘cut and pasted’ together on his computer! 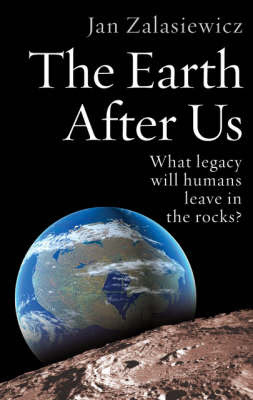 The book finishes with a summary of the historical geology of Grand Canyon and the Grand Staircase followed by a chapter on ‘Where to see the rocks’, covering such locations as Sedona, Petrified Forest, Zuni Cliffs, Canyon de Chelly, Monument Valley, Arches National Park and many, many more. I've learnt so much already, such as the effect of repeated transgressions and regressions has on the pattern of strata. So far, I feel I've barely scratched the surface of what this publication contains so it's certainly a book that I will repeatedly return to over the months and years. In short, a quite magnificent book and possibly the best £25 I have spent in a long while! 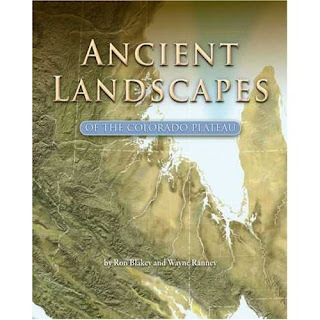 As well as buying the book, it is also worth taking a wander over to ‘You Tube’ and having a look at a series of films of Ron and Wayne’s joint lecture at the Grand Canyon Field Institute last year all about the book, the making of the maps and the Colorado Plateau story . Click Here. Oh Blimey, it's S104 Result Day! Brace yourself! It's result day! Nine months of sweat and mental toil come down to this. The suspense has been killing me for the last couple of months, so without further ado, my result is . . . . . YES!!!!! Fantastic! Never in doubt really, but there was a glimmer of a chance of a distinction leading up to the end of course assessment. However, the mark of 77% was tantalisingly 8 marks short. Curses! A shame, but when I think about the domestic turmoil that I was working through while doing the course it was pretty amazing that I was even within sniffing distance of a distinction. Living 100 miles away from half of my family, moving home and changing jobs isn't exactly conducive to serious study! But, I weathered the storm and got through it. In the end, I've got to be delighted by 85% for the coursework and 77% for the ECA. This great result has given me loads of confidence in my ability and brain power and allows me to think about Leicester University with excitement and confidence. There are lots of obstacles (particularly financial) to overcome before that goal is realised, but at least I know I'm capable, which was the reason for doing S104 in the first place. As a result of the pass I even get a qualification in it's own right! I now have a Certificate in Natural Sciences and may use the letters Cert NatSci (Open) after my name! I will of course be using this at every available opportunity and expect all my friends and family to use it when communicating with me from now on! So on that triumphant note I will leave you! Rest assured, lots of bubbly stuff will be consumed in due course! Education - 'tis a wonderful thing! Well, that's just about that! After nine months sweat and toil, it's almost over! S104: Exploring Science, is all but over with only the 25 question computer marked assignment left to do. Astonishingly, I achieved a whopping 97% in my final tutor marked assignment, which means that if I manage to get 85% on my End of Course Assessment, I will be awarded a 'distinction'!!! When I started out on this journey nine months ago, the goals were merely to see if I was up to study again after donkeys years of nothing, learn a bit and see if I can pass an Open University course - nothing more than that really. With all that has gone on domestically since the turn of the year, it's frankly astonishing that I have even a sniff of a distinction. There have been times when I even considered, albeit briefly, to throw the towel in. With so much going on around me, to then sit down and try to grapple with Quantum Physics, was a 'big ask' as Mark Lawrenson would say! But this course has given me so much that I never even considered beforehand. I now find myself routinely reading the BBC Science web pages, NASA's Mars mission pages and countless others to feed my almost unquenchable thirst for knowledge. But to have this thirst at the ripe old age of 49 is kind of interesting. I can never remember ever having had such an enthusiasm for learning all those years ago in school. Not even in college either! I'm left thinking that maybe one needs to 'live life' a bit, experience the repetitive dullness of employment, before one realises what is truly exciting and stimulating in life. In that sense, education is rather lost on the young. School and indeed further education seems geared to getting 'a job' at the end of it, without thinking beyond that. Well folks, listen up! THERE'S MORE TO LIFE THAN GETTING TO THE TOP OF THE CORPORATE LADDER! There, I've said it! Tar 'n feather me if you like, but that's what I feel. I can assure you, when I get my Geology degree, I won't be seeking employment with another consulting engineers, to resume that climb up the ladder again (not that I ever got above the second rung previously!). Nope, of more interest to me is research. As I've already said, if I can make some contribution, however small to the multitude of questions, asking how Grand Canyon came to be the way it is, I will die a happy man! If I can write a geology book like Wayne Ranney's, that make this wonderful subject understandable to the interested layman I will be very proud indeed! That's got to be preferable to meaningless staff appraisals, 'taking ownership of your deliverables' and endless corporate 'tosh' surely? End of Course Asssessment looming! So, the pressure mounts! The deadline for the S104, Exploring Science, end of course assessment is 28th of May! It's a HUGE piece of work and I have to say, I am not at all impressed with the Open University's choice of cut off date! They say we should post off our work at least 4 days before the deadline. Well, that just happens to be a Bank Holiday, so there is no postal service that day! The day before that is a Sunday, so there's no postal service then either! So I will have to look at getting it posted on Saturday 23rd at the latest. However, I'm going to be away for the weekend, so that means I'll need to have everything done and dusted by the end of next Thursday night! Arrrrrrgggghhh!!???!!! Anyway, that aside, it's going reasonably well so far and I think I'm on schedule to finish it in time. Just about!?! Progress was hampered by the OU's insistence on including an exercise that requires online discussions and contributions to the course forum. This involves online research and also needs the cooperation and efforts of all your fellow students to spark an online debate! Well, having to rely on ones online colleagues was never going to be that straight forward and the 'debate' has been virtually non-existant. Only 7 people have contributed anything at all, out of about 15 who started the couse in our group! That suggests either a major drop out rate or some students simply sacrificing a few marks in favour of getting on with the rest of the questions without this ill conceived hassle interrupting their flow! Maybe a wise choice, I'm beginning to think!?! AND, I've still not received my mark for my final tutor marked assignment, so I don't know at this stage what my final mark is for my course work. My tutor has been pretty excellent thorughout the whole course, taking over at short notice after our original Canadian tutor failed to get her work permit renewed and consequently got shown the door. I've already passed the course work anyway, so it's not that important I guess. Oh blimey, somebody stop me moaning! That's something my wife and I are doing way, WAY too much at the moment, but I guess that's just a sign of the stress we are under right now! There's got to be an outlet somehow! So tomorrow, Ruth and I are going to have a bit of stress relief by going to watch our beloved Bolton Wanderers play Hull City at the Reebok Stadium in what is the final home match of the Premier League season! It's a bit of an 'end of season' affair with nothing at stake for the Wanderers, but poor old Hull are hanging by a thread to their Premier League status! Should be fun! Before I go, take a look at this photo from the BBC Science web site which blew my mind this week! Taken by Hubble telescope, it shows a huge cluster of galaxies some 13 billion light years away! 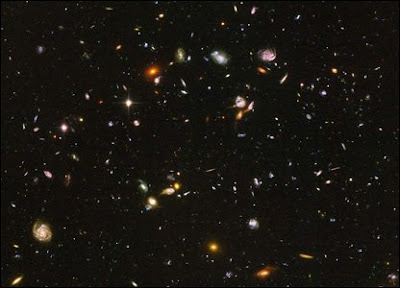 S104 has made me think a lot about the sheer scale of the universe and bearing in mind the vastness of our own galaxy, to then consider a whole cluster of galaxies as shown here, just goes to highlight the almost unfathomable immensity of the universe! When I finish my course, I'll have lots more time to talk about this stuff in more detail! Better get on - I've got an assessment to finish! Apologies for the deadly silence over the last few weeks! It's not that there hasn't been anything to blog about recently - far from it! But it has been a frantically busy, and extremely stressful time, not just for me, but all of my family too in so many ways. Where do I begin? Well as you know, as it stands I am living in our home of five years in Bolton, in the north west of England with our eldest daughter Anna-Ruth who is now in the midst of her GCSE exams. So Anna has a whole heap of stress to cope with and thankfully, so far, she's taking it all in her stride. Meanwhile, my darling wife Ruth and our youngest daughter Aimee Claire, have moved to Loughborough, in the East Midlands. Aimee has settled in superbly to her new school while Ruth gradually gets to grips with her new role in Nottingham Trent University. Starting a new job is tricky enough, but with the family split up from Sunday evening until Friday evening each week it obviously means that for Ruth, all the family childcare duties such as taking Aimee to Guides/trampolining/guitar lessons etc etc falls completely in her lap. Ruths mum and dad chip in of course with the school run and stuff like that, but it all leaves Ruth with precious little time to 'chill' or do anything for herself. It's all taking its toll which is heart breaking for me and I feel so helpless, being over 100 miles away! So it all makes our weekends so precious. Either I travel down to Loughborough or Ruth travels up to Bolton, which naturally costs a fortune in petrol at a time when our finances are stretched while trying to run two homes, albeit temporarily! And then there is the problem of employment! Ruth has obviously started her new job, but I now need to find an alternative position for myself by mid June. Encouragingly, I've been getting positive vibes from my current employers about the possibility of a transfer to one of its other offices in the East Midlands - either Nottingham or Derby. So hopefully something will come of that and give me one less thing to worry about. Now, just for a laugh, throw into the mix the small matter of me trying to finish my Open University science foundation course! I have now done all the computer marked and tutor marked assignments and averaged at about 83%. Only one blip of 60% has scuppered the chance of a distinction! So given the circumstances of my study, I think it's nothing short of a miracle that I've been able to achieve what I have. It has given me a lot of confidence that when I finally start my MGeol degree at Leicester Uni I will be able to achieve great things. Yes folks, after careful consideration, I have deferred my place at Leicester to the September 2010 start, which was a difficult, but necessary decision. That will give me a year to settle in Loughborough and be properly ready to get cracking! Can't wait!!!! ONE HELL OF A PARTY!!!! 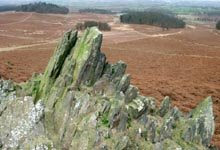 So, after getting all that off my chest, I'll get back to geology next time, which will be soon - promise! Hey! Do you speak Geology? After my sharing my thoughts last week regarding the ability or otherwise, of geologists to embrace the fact that they can actually be wrong sometimes, my thoughts this week have turned to that other strange tendency that geologists seem to have - the need to speak in gobbledy-gook!?! As you're probably aware by now, I went to Grand Canyon last year. (No, really?) Following my return I have had an insatiable thirst for knowledge of anything 'Grand Canyon', but particularly anything that will shed some light on how this magnificent place came to be. I downloaded every single one of the papers from the 2000 symposium on the 'Evolution of the Colorado River' - Click here if you would like to do the same! Now, I know I should perhaps wait a few years before trying to read academic papers, but the language used in some of them is absolutely unintelligible to anyone other than geological academics. Okay, perhaps little ol' me wasn't part of the target audience when these guys wrote their papers. But back in 1945, Donald L. Babenroth and Arthur N. Strahler wrote a paper on the Geomorphology and Structure of the East Kaibab Monocline . The interesting thing about this paper is the language it is written in! Even for the relative layman like me, it is very readable and understandable. Another paper by Chester Longwell in 1946 entitled 'How Old is the Colorado River?' was similar - straight forward and readable. Surely this is how it should be isn't it? Why should this fascinating subject be submerged in complex, ludicrously long worded, technical terminology, only understandable to a small minority? What on earth has happened in the last 50 years to turn geology into some sort of foreign language? Two geologists that have inspired me greatly over the last year or so are Dr Iain Stewart of Plymouth University in England and Wayne Ranney of Flagstaff, Arizona. Wayne, as you'll know by now is author of 'Carving Grand Canyon' and co-author with Dr Ron Blakey of 'Ancient Landscapes of the Colorado Plateau'. Iain is the presenter of the excellent recent TV series 'Earth: The Power of the Planet' and other superb geology and environmental television series. What these gentlemen have in common is that they both recognise that geology is a fantastically exciting subject that stirs the imagination of a great many people. They realise that while some people might go to Grand Canyon and say "ooh, isn't that lovely" and then hop on a helicopter back to Vegas, rather more people actually stop and wonder "how the heck did this place come to be"? That's exactly what I did and I went in search of a book that might tell me. A book full of long words and technical jargon would've been of little use to me. What I needed was exactly what Wayne's book provides - a detailed explanation of the theories and mysteries in a language understandable to the interested layman. The end result is a thirst for more! Job done Wayne! Similarly, Iain Stewart inspired me with his series and book mentioned above. 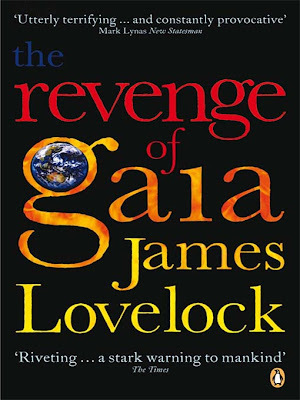 I think it was New Year's Day 2007, when I was hopping round the TV channels while staying at my mother-in-law's, that I stumbled upon ironically, the last in the series of 'Earth: The Power of the Planet'. This was basically rounding up the series with a look at the future of planet Earth. The straight forward, enthusiastic presentation style and above all, non-technical language was a sheer delight. Iain presents geology on television with a passion I can relate to. Surely this is how geology should be presented? Yes, I know, technical papers are not directed at layman. We're talking about different audiences and I appreciate that. But, it seems to me that so often these days, scientific news is regularly misinterpreted in the media, often to an embarrassing degree. I wouldn't be at all surprised if it is because scientific journalists simply don't fully understand the message of a particular paper after getting bogged down by the jargon! Okay, once I get my MGeol degree (how's that for positivity?) I will need to be submitting papers to peer review journals and these will need to be liberally sprinkled with technical language. But I hope there will always be room for a more thorough explanation within my text, in an accessible language that will make it understandable to a wider audience. Any thoughts? Post 'em up if you like! Before I go, Iain Stewart makes the point at the end of 'Earth: The Power of the Planet', that the our world doesn't need saving at all! Outraged? Well, there's no need to be! Our dear planet is quite capable of coping with whatever us clumsy, destructive humans can throw at it and is looking after itself quite well, thank you! What actually needs saving is the human being! More on this next time!